I had a lot of fun at Sephora recently. Some of these are my old favorites and a couple are new products for me. I love this primer. It makes my makeup go on easily and has a very nice smooth finish. It also helps my foundation stay on all day. This primer does not feel heavy. I have been looking for a great eyeliner to help me make a fab cat eye. This liner is so spectacular there are no words. It is a gel and has a rubber tip that aids in the application. Very easy to use. 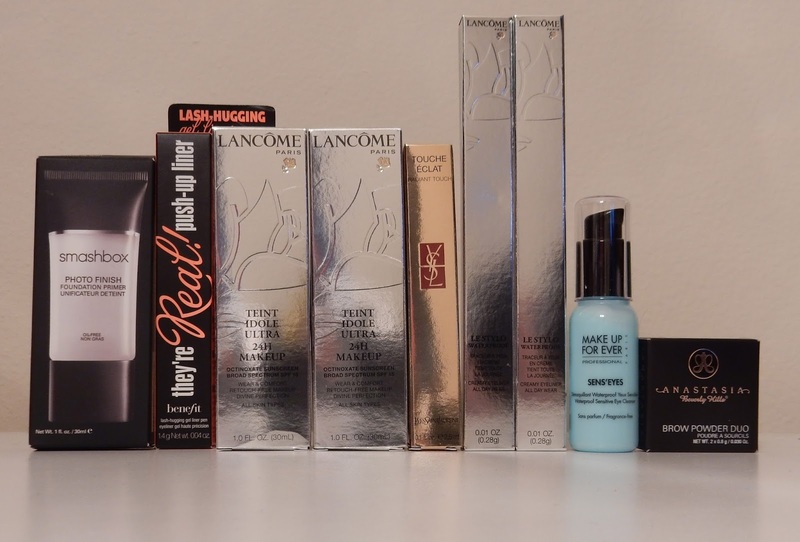 Lancome is one of the only foundations I have found that are light enough to match my skin. I love the teint idol because it goes on matte with just a touch of glow. It also really does last all day. This concealer has changed my makeup game. There are no words to describe how wonderful it really is. It goes on so smooth and does not settle into fine lines. It is also full coverage. Brightest blue eyeliner!! I'm in love. It stays on forever! Great color purple. Does not make my eyes look red at all. Stays on all day. I have very sensitive skin under my eyes. This is one of the only eye makeup removers I can use. If you have sensitive skin you should really try this. This brow powder is amazing! All of Anastsia's products are amazing. I am lucky enough to live near her store and have actually had the honor of her personally doing my brows.